Extended! $9* capped shipping Australia-wide. ** * Excludes GST. ** Applies to eligible orders. Click here for more info. Letter sound readers introduce the first 21 letter sounds. They also have a strictly controlled vocabulary that follows the letter-by-letter progression along with ‘tricky words’. 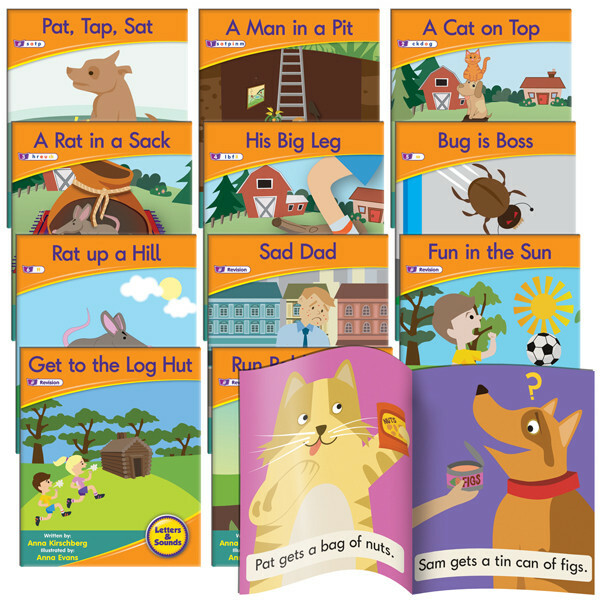 Set includes 12 fiction readers, each with colourful illustrations. Freight charges are based on the value of your order. Freight costs may exceed the above charges due to a schools remoteness and/or bulky items ordered. Schools will be informed of freight options before orders are processed. The majority of orders are despatched within 24 hours and are expected to be delivered within 5-10 working days. All orders are delivered by Australia-wide freight, with tracking available. If you would like to use your own courier, need express freight or your order is taking longer than estimated, please don’t hesitate to contact us on (08) 9445 7133. The majority of orders are despatched within 24 hours and are expected to be delivered within 5-30 working days. All orders are delivered by local freight companies, with tracking available. If you would like to use your own courier, need express freight or your order is taking longer than estimated, please don’t hesitate to contact us on (+618) 9445 7133. Sadly, your browser is out of date!